Have you guys ever tried black rice? Where in the world have I been?! I thought I would give it a whirl tonight. After work, I went by Kroger to grab some chicken and some veggies for the weekend! Also good FYI – it turns purplish when it cooks. Don’t freak out like I did! The water is pink too, so have something to set your spoon on so you don’t leave a purple stain on your white cabinets! Still trying to work on making sure the entire meal is ready at the same time, so that is another challenge for me with this meal. First off – start on the rice. 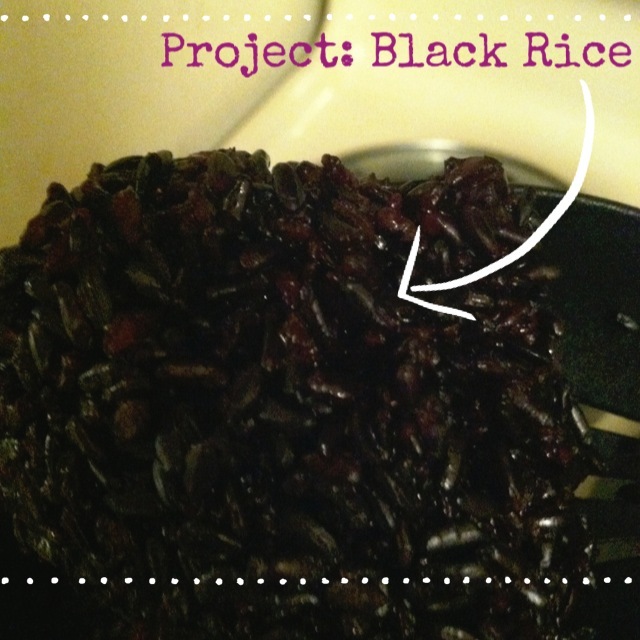 I followed the directions on the package, just 1 cup of black rice, 1 3/4 cups of water, and a pinch of salt. Bring that to a boil, and then simmer with a lid on the pan for 30 minutes. Easy. Next, I wanted to get my chicken going. I drizzled a little olive oil on my pan, added all the chicken tenderloins and set my stove top to medium. Remember, my oven is a little older and gets really hot. Just make sure you cook your chicken through! I then drizzled some more olive oil, and sprinkled salt and the dried herbs pictured above. I got the herbs as a gift- Dean & Deluca -the best dried herbs! I added the juice of one lemon to give it some additional tartness. Flip the chicken a few times, and I like for mine to brown. I turned up the heat to high just to make sure I had a great color on my chicken. I grabbed the chicken off my pan, and added the diced peppers and onions, and a little more olive oil. I thought it would be a great idea for a tomato too – but I did not like that flavor addition. Leave it off for your recipe! After my peppers and onions were nice and tender, I added the chicken back just to make sure they were both warm. Checked on the rice- and it was all done! Results: I am a huge fan! Great recipe, minus the tomato. And my meal was perfectly timed.